Disclosure: I was provided access to listen to this CD prior to its release from the vendor in order to write up an honest review. All views shared are mine and mine alone. Pre-order from Amazon for only $10.00 now. 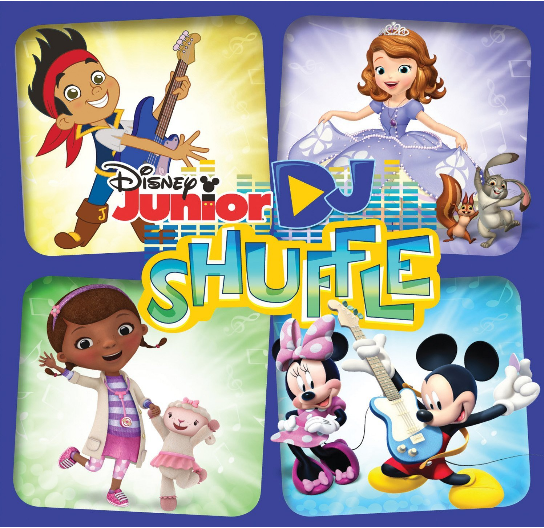 "DJ Shuffle," the first-ever Disney Junior music compilation album will be released by Walt Disney Records on TUESDAY, MARCH 18. Showcasing the new Disney Junior anthem, "DJ Shuffle," performed by meme master Parry Gripp ("Do You Like Waffles? "), the album also debuts the song "Hoppin' Out With You," a duet performed by Sofia and Clover from the Annie Award-winning series "Sofia the First" and other songs from favorite Disney Junior series. Featured karaoke tracks include "Blue Ribbon Bunny" from "Sofia the First," "Jake and the Never Land Pirates (Swashbucklin' Version)" from "Jake and the Never Land Pirates," "Time For Your Check-Up" from "Doc McStuffins" and "DJ Shuffle." The "DJ Shuffle" album will become available for pre-order on TUESDAY, FEBURARY 25 on iTunes and Amazon. A multi-platform event celebrating the music of Disney Junior begins TUESDAY, MARCH 11 with the debut of the "DJ Shuffle" music video on Disney Channel and Disney Junior. Also beginning March 11, parents/caregivers can submit videos via the Disney Junior Facebook page of their child performing popular songs from hit Disney Junior series. The videos will be highlighted across WATCH Disney Junior and DisneyJunior.com/DJShuffle, with some chosen to air on Disney Channel and Disney Junior during a special programming event in April featuring new music-filled episodes and culminating with a family night sing-along. The "DJ Shuffle" on-air programming is sponsored by BAND-AID® Brand of Johnson & Johnson and Blip Toys Disney Princess Palace Pets. The on-air programming event debuts on Disney Channel with a new "Mickey Mouse Clubhouse" airing Tuesday, April 1 (9:00 a.m. ET/PT), where the Clubhouse gang joins Minnie on the road for a pop song performance. The event also includes a new episode of "Doc McStuffins" guest-starring Broadway star Sutton Foster on Friday, April 4 (9:30 a.m. ET/PT); a musical-inspired episode of "Sheriff Callie's Wild West" premiering Tuesday, April 8 (9:30 a.m., ET/PT); and a song-filled episode of "Jake and the Never Land Pirates" featuring guest stars Sharon Osbourne, Leigh-Allyn Baker and Ariel Winter, who recur as Mama Hook, the Mermaid Queen and Marina the Mermaid respectively, airing on Friday, April 11 (9:30 a.m. ET/PT). All episodes will encore on Disney Junior as part of a family night sing-along event on Friday, April 18(5:00-9:00 p.m., ET/PT). Disney Junior reflects the emotional connection generations of consumers have to Disney storytelling and Disney characters, both classic and contemporary. It invites mom and dad to join their child in the Disney experience of magical, musical and heartfelt stories and characters, while incorporating specific learning and development themes designed for kids age 2-7. Disney Junior's series blend Disney's unparalleled storytelling and characters kids love deeply with learning, including early math, language skills, healthy eating and lifestyles, and social skills. In the U.S., Disney Junior is a daily programming block on Disney Channel and a 24-hour channel. There are 33 Disney Junior channels in 24 languages around the world. I was excited to see this upcoming Disney Jr. CD compilation press release, and after listening to all 29 tracks with the girls last night, I placed my order for a copy of this upcoming CD release, when it becomes available on Tuesday, March 18th. It was nice to see the variety of songs from all of my girls' favorite shows, including the new Sheriff Callie's Wild West, voiced by Mandy Moore. What a way to end the night yesterday than with an impromptu dance party in the living with the girls, and watching them sing along to their favorite Disney Jr. shows theme songs and other popular songs from the shows. Thanks to the folks at Walt Disney Records, three (3) lucky readers will win a copy of Disney Junior: DJ Shuffle, for you to enjoy with your child(ren). To enter, please complete the entries on the Rafflecopter form below. Good luck!